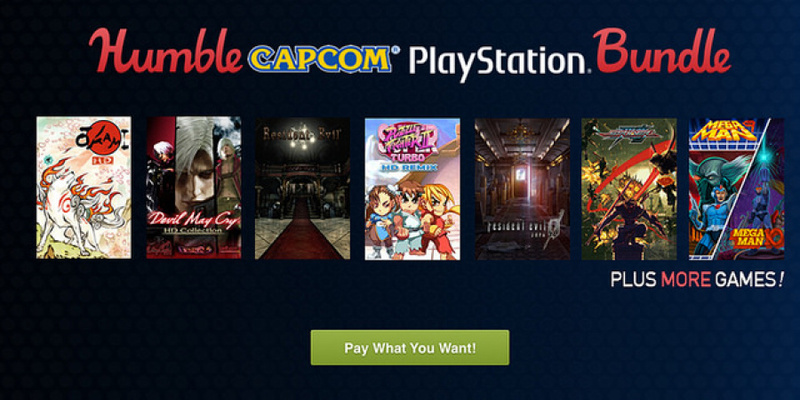 At long last, PlayStation has partnered with Capcom to launch its very own Humble Bundle. For those not familiar with this initiative, it basically allows you to get a slew of great games by giving money to charity. You can pick how much you want to donate (you'll need to start at $1), but paying above the average will unlock access to more content. The bundle begins with a $1 pledge, which will net you a 45 per cent discount on Street Fighter V for the PlayStation 4, as well as copies of Wolf of the Battlefield: Commando 3, Super Puzzle Fighter II Turbo HD Remix, and Final Fight Double Impact for the PlayStation 3. You'll also get Strider, and you'll be able to pick which platform you prefer that on. Then if you pay above the average price (which is $11.01 at the time of typing), you'll also get Lost Planet 3, Super Street Fighter II Turbo HD Remix, Resident Evil HD, Okami HD, Remember Me, and the Mega Man 9 & 10 combo pack. These are all on the PS3, but you'll be able to select the PS4 version of Resident Evil HD if you prefer. And finally, if you donate $15 or more, you'll get a 50 per cent discount voucher for the Mega Man Legacy Collection, Resident Evil 0 Remastered on PS4 or PS3, and the Devil May Cry HD Collection. That's a lot of game for a great cause. There is one catch: this is only available for those with a North American PSN account, but they're pretty easy to create if you haven't got one. You can donate and find out more information about all of the charities involved – as well as read those all-important terms and conditions – through here. The offer ends on 5th September at 11:00AM PT. Onlt on the ps3's psn store? Will probably cough up a buck just for that puzzle fighter game, guess I'm not a big Capcom fan. Well not enough to replay most of those games I've already played. Nah. I don't own a PS3, and I've donated to plenty of humble bundles before. I only wish the games didn't take up so much space on my PS3's hard drive (I'd need 47GB to download everything I don't have...and I've only got around 17GB left). Other than that, this looks like a pretty solid line up for the first Humble Bundle for the PlayStation family. Great for those still on the PS3. As usual not available in my country. Anyway I have most of them. Edit... now that I've come back and read the full article I realised pushsquare already said this, and totally had my back... damn you excitement. Damn you to hell. I set a canadian account its worth it not just for this offer but also for flash sales. The exchange rate makes it worth it to buy games from the store. Some of the stores online where you buy the PSN cards do not charge any commission for the cards either so well worth it. Humble Bundle is great. It's how I have so many games on my Steam account. Great to see PlayStation games on the bundle this time around. Funny thing is, I usually have the money go to the site and nothing else because without them, we wouldn't be able to get a whole bunch of games for a great price. Tons of games, giving to a good cause, what's not to love ? If I didn't already have more than half of these I'd be all over this.